I missed Sorghum Travels From The South To The Mainstream when it first came out, though it's making a point I've been making, too, for some years. Four pretty good-looking recipes may make it worth your while to check out. 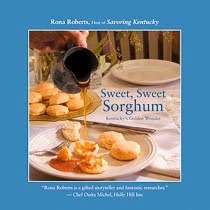 Also available at Kentucky Artisan Center, Log House Craft Gallery, Kentucky Horse Park, Windy Corner Market, Morris Book Shop, Carmichael's Book Store, Joseph Beth Booksellers, Good Foods Market, Kentucky Proud Market, Hunt Morgan House, Ruth Hunt Candy, Alfalfa Restaurant, and amazon.com. Copyright Roberts & Kay, Inc., 2011-2021. Simple theme. Powered by Blogger.